Last week, local markets saw Asian nations buying small gold jewelery to celebrate Diwali Day or the Festival of Lights, but at lower rates compared with the same period last year, local gold and jewelery trade officials said. Last week, local markets saw Asian nations buying small gold jewelery to celebrate Diwali Day or the Festival of Lights, but at lower rates compared with the same period last year, Those nationalities through the purchase of gifts and gold coins. They explained to Al-Emarat Al-Youm that there are major reasons behind the decline in sales, including the high price limits of gold during the current period compared to last year, and the application of value added tax, pointing out that the outlets were counting on Diwali to stimulate sales, . 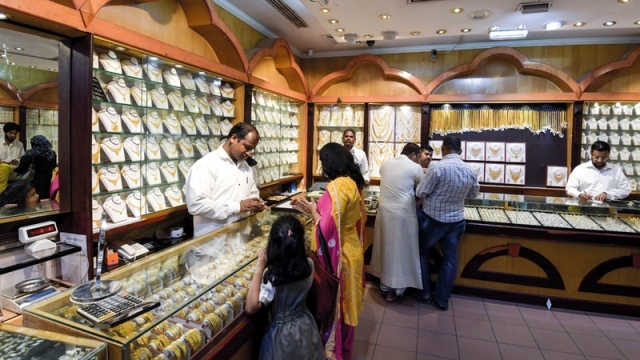 "Last week, local gold markets saw a surge in jewelery and gold jewelery purchases by Asian nationals on the occasion of Diwali Day and the Festival of Lights," said Deb Rajesh, sales manager at Al Matrooshi Jewelery. "He said," Although the markets recorded an improvement in sales, they were less than the sales of the same event last year. " "The drop in sales this year is due to the high price limits of gold in the current period compared to last year, as well as the willingness of traders to provide liquidity to pay their family obligations, which has made them more focused on purchasing small and lightweight pieces of work," Rajesh said. Golden ». "Young people now account for most of the sales," he said. "They focus on buying 18-carat, as part of buying diwali gifts for mothers." "There is a strong demand for gold and jewelery from Asian nationalities to celebrate Diwali," said Omran Bougani, a sales officer at ZazaZaza Jewelery. "However, it is less in comparison to last year during the celebration period By the same token, "referring also to" high gold prices, as well as the application of VAT. " "Most of the purchases focused last week on 18-carat, especially in light weight pieces," Bougani said. "It is notable that in the celebration of Diwali this year, the sales of gold jewelery sales declined compared to the same period last year," said Manish Sharma, a sales officer at a jewelry and jewelry shop. Sharma agreed that "currently high gold prices, as well as the introduction of value added tax, could be the most influential factors in lower buying rates." "The Diwali event has stimulated sales in gold shops, but not for a lot of sales outlets," said Ashwin Sonny, sales officer at Safari James Jewelery. Last year during the same period. " Gold prices yesterday recorded a slight decline of 25 fils in the 24 and 22 carats, compared to last week's prices, according to the prices quoted in the Dubai and Sharjah markets. The price of a gram of gold 24 carats, 148 dirhams, down 25 fils, while the price of grams of gold 22 carat, 139 dirhams, a decline of 25 fils also, while the price of 21 carat at 132.75 dirhams, and settled the price of grams 18 carat gold at 113.75 dirhams.